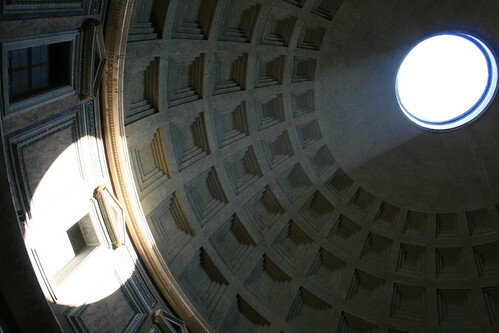 In an effort to compete with J (who took the above and so many other great pictures) and his various hobbies, I have become completely obsessed with The Pantheon. I went back yesterday for my second visit because I can't get enough of that place. Somehow I don't think it's quite proper, or adequate, to say "I can't get enough of that place" about the Pantheon, as though I'm talking about the DSW shoe warehouse or something, but I'm serious. I'm completely in awe. It's worth a trip to Rome just to stand inside and stare up at that inconceivable dome and feel the power so much bigger than yourself - yes, literally and figuratively.